It's only two days into the new year, and some of us have already given up on our weight loss resolutions, but not one tubby tabby who is angling to replace Jessica Simpson as the feline face of Weight Watchers. Tiny Tim was brought into Southside Place Animal Hospital in Houston last December, tipping the scales at an alarming 35.2 pounds. After they were unable to find his owner, the hospital took on Tim as a permanent resident, with the stipulation that he lose the weight. Following a strict regimen of diet and exercise that involves being carried to the front of the clinic at least three times a day (he has to walk the 50 feet back to his room for meals), the 9-year-old cat has managed to shed 6.6 pounds. But even kitties are prone to falling off the wagon, and at one point his weight plateaued, until staff realized it was because he was sneaking dog food as a midnight snack. Tim is still at risk for health problems such as arthritis and diabetes in the future, but remains "perfectly healthy" as he continues to meet his weight loss goals. 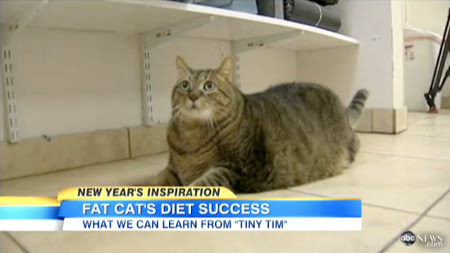 When asked about his plans for the new year, the tabby says he's ready to toss his fat jeans, and hopes to be down to 20 pounds or less by the end of 2013. Avery's Kitty Piddle Drink Is "Sodasgusting"
Advertise On Catsparella In February! TUFT Hand Painted Cat Pillow Giveaway Winner! Purrfidious Cat Clock Giveaway Winner! TUFT Hand Painted Cat Pillow Giveaway! My Appearance On "The Dr. Oz Show"! J. Crew's Tabby Cat Sweater Is "Feline Fabulous"